Ian was the founding member of CCB Accountants. His formal accountancy studies commenced in 1965, and continued until he successfully completed a Fellowship Diploma of Business Studies (Accountancy) at the Royal Melbourne Institute of Technology in 1973. He later completed a Graduate Diploma in Public Accounting at Philip Institute of Technology in 1982. His further accountancy and very wide-ranging business studies are substantial and ongoing. Ian holds a Public Practice Certificate from CPA Australia, and also holds Fellow status membership of that organisation, of which he has been a member since 1975. Ian commenced his accountancy career in 1970 with Chartered Accountants, Peat Marwick Mitchell (now KPMG), first as an audit assistant, and later as an audit senior and audit supervisor. In 1974 he transferred to Chartered Accountants, Parkhill Lithgow Gibson (now BDO) in the role of an audit supervisor. In 1975 Ian was appointed as the Financial Accountant for Federal Hotels Limited, a listed public company with extensive hotel and casino interests throughout Australia. He was later promoted to a financial management position directly reporting to the General Manager of that company. 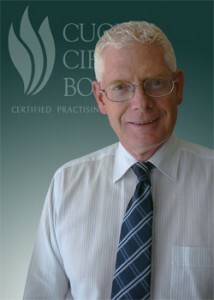 In 1978 he commenced the accountancy practice now known as CCB Accountants. Ian is widely regarded and respected for his superior technical and personal skills and attributes. His passion to meet needs at a high level and to achieve value underpin his relationship with his clients and his CCB Team Members. Over the years, Ian has amassed experience and skills in a very wide range of industries and businesses. In particular, he has gained unique skills and experience in the Australian residential aged care industry, in which he has extensively practised since 1986. Away from the firm, Ian is a dedicated family man. After that, and among many interests he particularly loves reading, travel and sport, both as a participant and as a spectator. His current participation highlight is playing cricket for the Mount Martha Reds, and his enduring spectator highlight is following his beloved AFL football team, Essendon. Troy joined CCB Accountants in 2017. He holds a Certificate of Public Practice issued by Chartered Accountants Australia & New Zealand. Troy began his accounting studies at Pepperdine University in the USA while on a volleyball scholarship. He then returned to Australia to complete his studies, initially at La Trobe University in Melbourne, then moving to Canberra where he finalised his undergraduate studies at the Australian National University graduating in Commerce in the year 2000. He moved to Canberra in 1998 to join Volleyball Team Australia at the Australian Institute of Sport. While part of the team he played in various major championships including World League and Olympic Qualification Events and narrowly missed selection in the 2000 Olympic Team. Troy is a Chartered Accountant with in excess of 15 years public practice experience. He is a highly motivated individual with extensive experience in small and medium sized enterprises. Prior to joining the team at CCB Accountants, Troy gained invaluable experience working with a number of accounting practices including Beames and Associates, EGA Corporate Advisers, Johnson Partners and his own firm Goodman and Associates. Troy has undertaken substantial work with franchisees, the hospitality industry, the medical profession, investors, building trades, logistics, registered training organisations, manufacturers, call centres and various other industries. He is a great team player who understands all business owners are different, and he takes pride in engaging with people to understand their needs, help provide solutions and attain desired outcomes. Troy has excellent problem solving abilities and a practical approach that helps business be progressive, while giving peace of mind that his clients are in good hands. Troy and his wife Dannielle have three young children who help make every day vibrant. Spending time with family and friends, socialising and playing sport are a big part of Troy’s life.